I've found it difficult to review Reason to Breathe by Rebecca Donovan as I had somewhat mixed feelings about it and it has been hard to balance out what was came across more strongly, the good or the bad. I was quite curious to read Reason to Breathe. 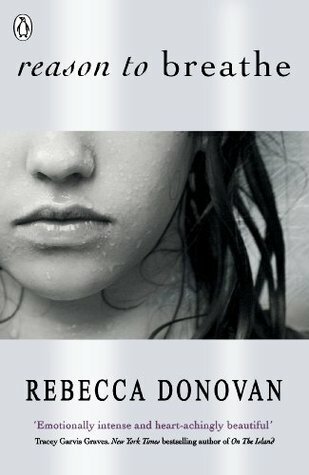 I don't often come across books that deal with family violence and it is something that I feel very emotional about. It invokes strong reactions in me and I can see that my own personal feelings about the topic will always colour my opinion of books that cover this topic. Reason to Breathe is the story of Emma, a girl who in appearances seems perfectly fine - she's hard-working, smart, and athletic - if somewhat distant and aloof to all of her classmates aside from a single friend. But inside, Emma is far from okay ... she's living with her aunt and uncle and their two small children and she has to deal with the physical and emotional abuse of her aunt. Because of this, Emma holds everyone at a distance. She views herself through her aunt's evil eye and she's counting down the days until she can escape to college and to freedom. That is, until one day, a new student takes a sudden interest in Emma. He's really curious to know more about her and Emma can't resist his good looks, his charm or his persistent ways. Let me start with what I didn't like. I feel as though Emma's main reason for not reporting the abuse that she suffers isn't adequate. I didn't believe it to be enough because the reason Emma remains quiet about the physical abuse is because it will ruin the lives of her two young cousins. If her aunt is charged with child abuse, Emma reckons that her cousins will be put into care and they will suffer needlessly. But the only way in which I could believe the safety of the cousins to be a fair reason to counterbalance Emma's torture is if we ever saw Emma's aunt to be a decent human being. I never saw this, so I couldn't believe that this aunt is magically a wonderful, caring parent AS WELL AS being this evil incarnate woman who abuses Emma so cruelly. There isn't any sort of depth or complexity to Emma's aunt's character. All I ever saw of her was her mean side in which there seemed to be no reason to cut Emma, to burn her, to leave her in an inhumane living conditions. And because of this, while I felt sorry for Emma for what she goes through, the abuse also didn't ring true for me as a reader as much as it could have done. I couldn't decide whether or not I really liked Emma as a main character. She's a bit too eager to play the martyr for the sake of her cousins and I found myself rolling my eyes at the huge difference in the way in which she sees herself and the way in which the male population at her school apparently sees her and for that I didn't always connect to her. I get why she doesn't play nice with other people her own age and I did like seeing her break out of her shell a bit. I'm glad that she had at least one close friend for whom she had no secrets and didn't have to hide herself away from, even if that friendship gets tested quite a bit throughout the novel. Every girl needs a best friend. And I did mostly like her relationship with the new boy, Evan. I like how upfront and honest Evan is with Emma. I like that there's no playing of games with Evan. He's curious about Emma, he's very open with his intentions to date Emma and he pursues her doggedly even though she treats him pretty bad. He seems content to be friends for ages even though he clearly wants more, but he can see that Emma isn't ready for anything more, on a phsyical as well as emotional level, and I like that. And I like that they talk and really seem to connect as friends. They're both artists, her a painter and him a photographer and I found both of those hobbies to be interesting to read. I can definitely see how this book won't be for everyone. Physical/emotional abuse is quite a difficult subject to read about! Brilliant review! I can understand how you had mixed reviews on this, I'm not sure whether to read it or not. I'm glad that the book wasn't all bad, Evan sounds like a good character. Fantastic review! I'm kind of on the fence about reading this one, because I don't think I'd be able to read about the abuse. I'd probably give it a chance if it came in at my library, but I doubt it'll be one that I'll actively search out. It can be very difficult to read about this level of abuse, so I can understand where you're coming from! You read this in just over a day? Wow! I guess that says something about it. I am usually very hesitant to pick up books that deal with weighty topics like this, but you have me curious about this book now. Lovely review! Yes I did. That's mostly what I meant about whether or not the issues that I had with the book were enough to counterbalance the fact that I flew through this book?